We recently updated our list of the best Star Wars total conversion mods, but what if you just want a taste of Star Wars in your games? What if you just want to fly around Grand Theft Auto 5's Los Santos pretending you are Han Solo? Well you can do exactly that, as we've done in the video above. 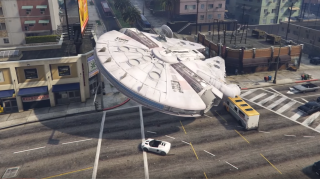 Modder KAFAROS reskinned GTA's jet fighter to look like the Millennium Falcon, and we simply couldn't resist. You can find KAFAROS's Millennium Falcon mod here, and we also used a mod by JJxORACLE to turn all of Los Santos' blimps into Imperial Star Destroyers, which you can download here. Just remember not to have either mod installed while you are playing online, or you risk having your account banned.